Anaqua is a leading provider of intellectual property (IP) management software. Since 2004, it has given corporations and law firms a unified view of all things related to their patents, trademarks, domain names, trade secrets and so on - including data, workflows and other services. After struggling with a time-consuming, rudimentary reporting system, Anaqua chose Sisense to better manage, analyze, and visualize data in easy-to-use dashboards and reports. Anaqua also decided to embed Sisense into their own software as part of a product strategy built to enable greater visibility and control over the full IP lifecycle. This boosted the company’s offering, helping to add more customers in the first quarter of 2016 than during any other time in their history. Sisense is an entirely stand-alone solution. With no hidden costs, it was easy to get the execs on board after our trial experience. Aaron Stronge, Associate Director of IP Analytics at Anaqua, and Dave Bartle, Chief Architect at Anaqua realized something was missing in their product. Anaqua helped clients bring all their disparate data from multiple IP portfolios into a vast database, but the insights they could draw were limited. “As we embarked on improving business intelligence, our clients started asking for better analytics and the need became urgent. It was too daunting a task to build BI in-house, but we knew clients with a lot of data needed a beautiful, intuitive way to look at it,” explained Dave. What’s more, Anaqua’s clients were understandably concerned about BI security. They were dealing with sensitive information, and many clients had opted for On-Premise rather than SaaS versions of the product. These people wanted to know where their data would “live” – and be reassured that there was no way it could either be compromised or accidentally accessed by other clients on the system. As changes in the market stepped up the pressure, Anaqua raced to find a solution. The team began by evaluating around 25 different BI tools, based on the following criteria: it had to be web-based, it needed a user-friendly interface that allowed quick and easy dashboard building, and it must be possible to white label. Over the course of a few months, the team had eliminated pretty much all of the competition as lacking either the essential features or requiring astronomical development time and additional resources to deploy. Then, they decided to trial Sisense. Bartle and Stronge expected to wait weeks to see any results, but in a single 30-minute demo, the Sisense sales team showed them how to configure the Elasticube, Sisense’s data stores, and build a dashboard from scratch. They Anaqua guys couldn’t believe their eyes. Bartle immediately began showing the results to others in the company, explaining how easy it was to build without any companion products to make it run properly. 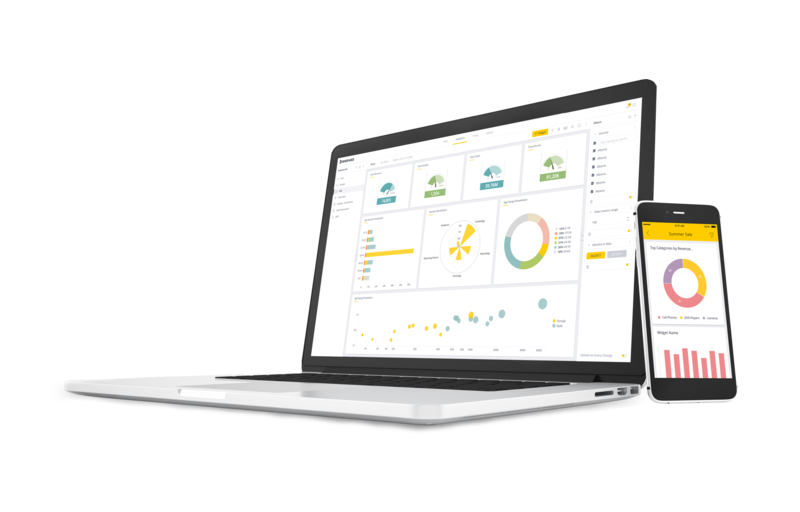 “With Sisense, we saw we could build a dashboard in a couple of minutes and it’s ease-of-use blew us away,” explained Stronge. This quick and easy dashboard building process was the real clincher that persuaded Anaqua to choose Sisense. Sisense is now used as a white label, embedded analytics platform, which can be logged into via the Anaqua software. From here, users can see and manipulate dashboards and analytics, to gain an in depth visualization of IP operations. For example, users can quickly view KPIs like total number of patent filings (broken down by year, country, or status); search through their applications, break down the workload by checking where they are by critical task, and track staff productivity. They can also evaluate how well different law firms and external counsels are performing for them by cross-referencing with success rates, response times and lead times – and can bring in public patent data through the recently acquired Acclaim IP, to draw out better and better insights and context. Plus, their clients can swiftly assess the cost and value of their investments. As Stronge explains, one thing that companies don’t do enough is check which patents in their portfolio are worth keeping, once they factor in annual maintenance fees. Using Sisense, clients can swiftly calculate the year-on-year savings of dropping certain patents that don’t perform well. To tackle the security concerns, Anaqua builds a separate Sisense Elasticube for each customer, to silo data and ensure they’re kept within their own, safe environment. To make sure they get it just right, the team have been onboarding 10-15 clients per week, on an individual basis tailored to their requirements. The response has been highly positive – and uptake is rapid, with customers up and running in just half an hour using simple, scheduled procedures designed to streamline the process. Sisense works for us because it offers great security options and lets us create separate data cubes for each client, since the information is often sensitive and clients get squeamish about storing their information with others. As Stronge explains, the team didn’t introduce Sisense into the mix to fix a specific business problem, but rather to improve the overall capability of the product by giving clients the freedom to run their own data projects. However, an unexpected benefit was that it made the sales team’s job massively easier – so much, in fact, that in the months after Sisense was introduced, Anaqua on-boarded more clients than at any time in the company’s history. “Analytics is now a core offering of ours and a key differentiation,” explained Stronge. What’s more, Anaqua now uses Sisense to track how users are engaging with the application, what kind of dashboards they build, and what queries they make. They’re using these insights to continue to hone their product, delight their customers, and make sure they stay at the forefront of the industry. Our clients are savvy in terms of their analytics needs, and demand data and processes they can trust, and Sisense helped us do just that.